Liberty Square housing project will be redeveloped into a mixed-income housing development by 2020. Miami-Dade County’s oldest and largest housing project, Liberty Square -- or the Pork and Beans, as many locals know it -- is going to be redeveloped. The county is rolling out an ambitious plan to transform the sprawling Liberty Square site into a mixed-income housing development. The project, still in its infancy stages, will require several votes from the county commission and a competitive bidding process to choose a developer. 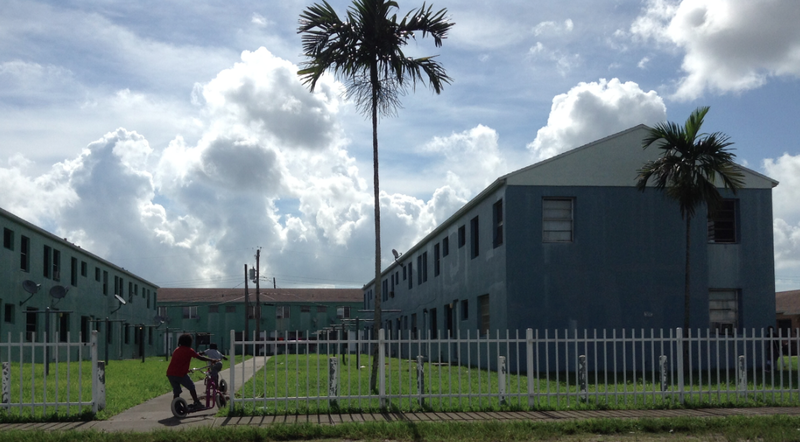 This week, the Miami-Dade Public Housing Agency met with Liberty Square residents to discuss the upcoming changes. Michael Liu, director of the county’s housing agency, said the more than 600 residents currently living in the Liberty Square housing projects will not be displaced. “One our guiding principles… is that all residents in good standing will have a unit to return to,” he said. “If you’re a resident and you follow the terms of your lease, you’re in good standing." The new housing at Liberty Square will be built in phases. Residents won’t move out of their current units until new ones are finished. Part of the project will include affordable rentals and single-family homes in other parts of Liberty City. Miami-Dade County is investing $74 million into Liberty Square and its surrounding areas. $46 million will be used toward new housing on the actual Liberty Square site, but that is not the total amount for the project. Whoever the county chooses to build the new homes will need additional financing. Michael Liu estimates the project could cost up to $120 million. The remaining funds from the county will go toward affordable workforce rentals throughout Liberty City, single-family homes and infrastructure improvements. According to the county, Liberty Square tenants will not have to move out of their current residences until new units are built to replace them. The housing will be built out in five phases. The first phase will be on an empty lot formerly known as Lincoln Gardens that will be added to Liberty Square. Can anyone else move in besides current tenants? Yes. The county’s plan is for a mixed-use development project, which means there will also be available units for individuals with various income levels who are not current tenants. The county expects to put out a request for applications for developers in March. The selection process is expected to be complete by fall 2015. The plan is to break ground in 2016 and complete all phases by 2020. That is not yet clear as the competitive process for concrete designs and plans has not yet started. However, there are some general amenities outlined by the county, such as impact-resistant windows, central air conditioning, a child care center, tot lots and other recreation spaces, library and computer lab, and a laundromat. How do I get a job on this project? The redevelopment project is teaming up with the Employ Miami-Dade initiative to offer construction jobs training. The county estimates the redevelopment project will create 2,290 jobs during the four-year construction period. For more information about Employ Miami-Dade, call 305-756-0605. Tenants who live in a Liberty City apartment building with leaky ceilings, moldy walls and toilets that don’t flush protested Friday morning to get the attention of Miami Commissioner Keon Hardemon. They live at 6040 NW 12th Ave., a building city officials and tenants say is owned by a slumlord. When the housing market collapsed in South Florida, many homeowners who lost their homes became renters. And the region's blazing-hot rental market is making this a profitable place for part-time landlords. Real estate website Zillow.com rates South Florida the second-best market in the country for landlords who don't rely on tenants for primary income. The average monthly profit is $515, right behind Oklahoma City at $536.